JAM* Architecten & Merosch. (2011). Maxdak. Amsterdam, Netherlands: Programmabureau Klimaat & Energie & Projectbureau Wibaut aan de Amstel. Oke, T. R. (1982). The energetic basis of the urban heat island. Quarterly Journal of the Royal Meteorological Society. 1982, 108(445), 1-24. Rahola, B. S. van Oppen, P., Mulder, K. (2009). Heat in the city. An inventory of knowledge and knowledge deficiencies regarding heat stress in Dutch cities and options for its mitigation. Netherlands, Delft: TU Delft. Van Hove, B., Steeneveld, G.-J., Jacobs, C., Heusinkveld, B., Elbers, J., Holtslag, B. (2011). Quantifying the Urban Heat Island Intensity. Literature review of observational studies and assessment of UHI intensity in the Netherlands. Wageningen, Netherlands: WUR. Zakšek, K., Oštir, K., Kokalj, Ž. (2011). Sky-View Factor as a Relief Visualization Technique. Remote Sensing, 3(2), 398-415. VAN DER HOEVEN, Frank; WANDL, Alexander. 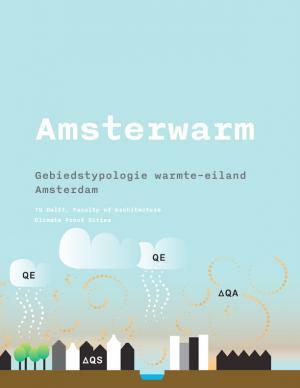 Amsterwarm: Gebiedstypologie warmte-eiland Amsterdam. BK projects, [S.l. ], v. 1, n. 1, jan. 2018. Available at: <https://journals.open.tudelft.nl/index.php/bkprojects/article/view/1973>. Date accessed: 26 apr. 2019.